Born 7 May 1887 in Baildon in Yorkshire to James (a farm bailiff) and Elisabeth (Hannah Sotheran) Snowball who had seven children at the time of the 1891 census (4 girls, 3 boys). During his career he would be professional at Scarborough Town, Royal Portrush, Portmarnock (1906-1909? ), Bradford and Criccieth and was at some time a private tutor to Lord Londesborough of Blackney. 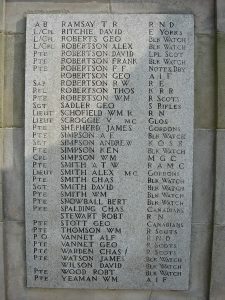 Snowball may have had some connection with Carnoustie (may have settled there before the war), as his name appears on the war memorial and is believed to have assisted the famous clubmaker, Robert Simpson. While at Portmarnock, golf clubs were sold with the Bertie Snowball stamp. 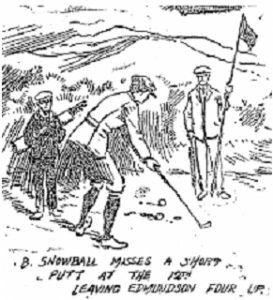 Bertie Snowball was runner-up to James Edmundson in the first two Irish Professional Championships (1907 and 1908). Bertie’s elder brother Arthur was also a professional at Portmarnock and later at Ballybunion Golf Club. In the 1911 census when based at Criccieth in Wales his marital status was ‘married’ but was not living with his wife and doesn’t mention any children at the time. It is believed he may have married a Carnoustie girl and went to live in Scotland for a time taking this position in Wales before returning to Scotland. 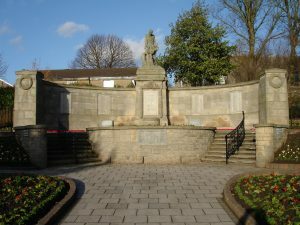 Snowball joined the fifth battalion of the Royal Highlanders Black Watch regiment where he reached the rank of corporal and died on the 9 May 1915 on active duty in the fields of France and Flanders at the battle of Aubers Ridge, a line from the report of the battle read: “Poor Bertie Snowball, a letter had to be opened to get his young wife’s address”: he left behind a wife and three children. 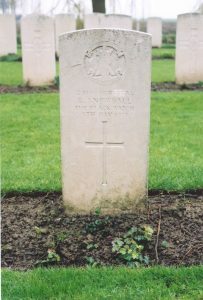 His final resting place was at Le Trou Aid Post Cemetery, Fleurbaix near Armentieres. 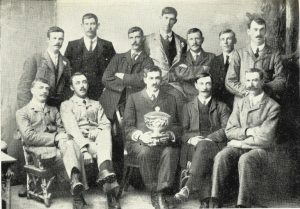 Irish International team who played Scotland for Springvale Bowl in 1907 prior to the inaugural Irish Professional Championship. Artillery bombardment started at 5am and continued 110 minutes. Immediately on it’s cessation the Battalion left the assembly trenches to gain the fire trenches advancing in close touch with 1st Worcestershire Regiment. This movement was unfortunately checked by reason of the Sherwood Foresters not being able to vacate the fire trenches and from Rue Petillon forward the Battalion suffered badly from very heavy machine gun and artillery fire. On attaining the objective, the Battalion occupied the assembly and communication trenches in rear of 15 and in the proximity of where the Riviere des Layes crosses the trench line. Here the machine gun detachment rejoined having closed in on the right. At 9am a fresh bombardment was begun by our own artillery. During the whole forenoon, the Battalion remained in the assembly trenches and suffered considerably from heavy shellfire. At 1pm our artillery began a further bombardment as a result of which many casualties occurred in the Battalion through shells dropping short. Throughout the afternoon the congestion in the trenches continued and towards nightfall the enemy’s bombardment of our trenches increased especially in the neighbourhood of the Riviere des Layes and the Sailly Road. At 10pm Brigade Message 59 was received ordering the Battalion to proceed to Divisional Reserve and bivouac in assembly trenches south of Rouge de Bout in consequence of which the Battalion was collected in communicating trench by Sailly Road and in Section 1R and orders were issued to O. B.’s Companies to proceed independently to the crossroads Rue de Quesnes where the Battalion would assemble. At about 1.30am on 10th May the Battalion arrived at Road junction at Rouge de Bout and bivouacked in field north of the junction. During the day, all ranks of the Battalion displayed excellent coolness under particularly trying circumstances and the Commanding Officer accordingly forwarded in course a number of recommendations for favourable consideration of the conduct of various officers and other ranks.